Well you have to say this fixture at Mill Meadow pretty much had it all, rain, sleet, snow, an injured linesman, a floodlight failure, five more United goals and 3 big points. 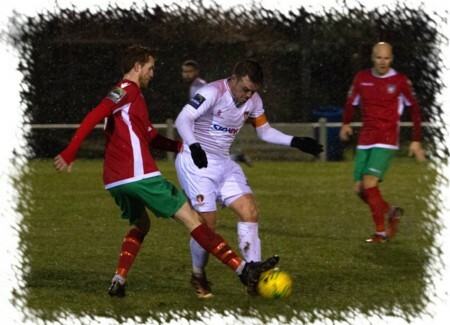 United came into this fixture looking to increase their lead at the top of the table to nine points and this was pretty much sewn up in the first 28 minutes as Paul Hughes’ side raced into a four goal lead as the sleet and snow continued to fall. It took just 3 minutes for United to break the deadlock, Lee Barney chasing a ball down the left side, beating the Saints on-rushing ‘keeper Carl Dennison to the ball out on the side-line before firing a perfectly directed low shot from out wide into the unguarded Saints net. The home side had what was to be a rare first half effort a few minutes later when Alex Paine met a corner from the left, his header going well wide of the target and then within a minute United had another. Barney broke away on the right this time, his centre was partly cleared in the middle but went straight to skipper Scott Donnelly who blasted it back into the net from 12 yards. Still inside the first 20 minutes and it was three. Scott Bridges chased a throughball, a Saints defender got to the ball first and passed back to Dennison, Bridges however wasn’t giving up and charged down the ‘keepers clearance before bundling the ball home on the line. Barney by now was causing havoc for the home defence, in the 24th minutes he got away again down the left before firing across the middle of the box, Dennison did well to slide out and kick the ball away as Nick Elliott closed in from midfield. This was only to be a temporary reprieve however as a free-kick played into the Saints box on 28 minutes saw Josh Chamberlain go for the ball only to be cluttered into from behind by Adam Kirby leaving referee Creswick with little option but to point to the spot. Donnelly stepped up and cool as you like sent Dennison the wrong way to put United 4-0 up with less than half an hour played. Just the other side of the half hour mark Barney twice went close, Rylan Myers and Elliott combined well on the right before pulling the ball back to United’s top scorer who fired inches wide and a couple of minutes later he collected the ball from Bridges 20 yards out, beat Dennison with his shot but only found the side netting of the Saints goal. 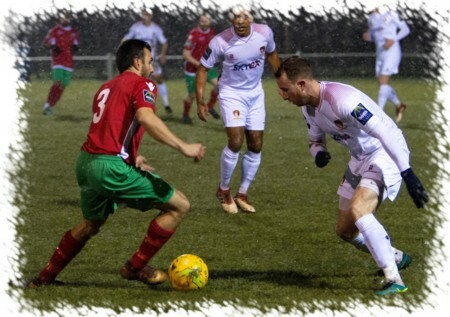 The final effort in first half stoppage time came from the home side, Keaton August trying his luck from range but even with the slippery conditions this was never likely to trouble Charlie Burns in the United goal. A couple of changes came about as we resumed after half-time, one of the assistant referees got injured during the first half and was replaced and United also made a change with Ash Nzala replacing Chamberlain in the United attack. The change for United paid immediate dividends as a fifth arrived just five minutes after the re-start with Nzala being put through on the Saints goal, the United striker finding his feet immediately on the extremely wet pitch and firing across Dennison from the edge of the box into the far corner. 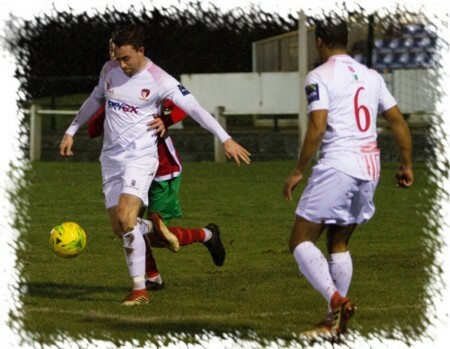 Eight minutes later the home side got a somewhat surprising consolation when August raced away down the left side, his low centre to the far post being fired home by Saints substitute Rhys Rabess who had arrived un-seen on the right side of the United box. Despite conceding, United were straight back on the attack and nearly had a sixth a couple of minutes later when Nzala chased the ball to the bye-line, beat off a challenge and then threaded the ball back to Bridges, his goalbound drive was well kept out by Dennison with the Saints defence clearing the danger quickly. Just the other side of the hour mark Dennison was again called into action, this time to deny Barney a second, the United striker collecting a Toby Little cross from the left, his initial shot was pushed out by Dennison and when the loose ball ran back to Barney his follow-up was off target from an acute angle. With fifteen minutes remaining it was time for Burns to get busy, as a cross from the right was met on the volley by substitute Evans Lamboh with Burns doing well to palm the effort away as Roddy Collins nipped in to take the ball away to safety as the Saints forwards closed in. Two United substitutes combined a few minutes later as Nzala pulled the ball back from the corner of the box to Callum McAllister who fired just wide of the target from 18 yards out. Then with four minutes to go it all went dark as the hosts floodlights went out. With all around trying to work out what the result would be if they couldn’t get them going again it was a great relief when after five minutes we “had light”. Play resumed soon after but neither side really pushed on and referee Creswick drew the game to a conclusion with United now sitting pretty nine points ahead at the Bostik South Central summit. Final words go to the hosts, Chalfont St Peter, and the match officials who deserve much credit for even getting this game on in such challenging conditions, and to all of the players for a mighty effort battling not just each other but the elements also. United Man of the Match: Lee Barney.